Ben Roberts on the attack on his return to the Castleford Tigers side against Leigh Centurions. Castleford Tigers star Ben Roberts believes tonight’s game at Warrington gives his team a chance to make a statement that they are genuine Super League contenders this year. 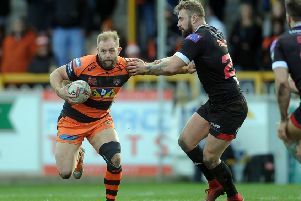 Roberts expects home side Warrington to offer up a big test of the Tigers’ credentials, but after the way Cas played in their opening match he reckons they can go into the game with confidence. He said; “It is a good opportunity for us to make a good statement. “In the past we’ve probably been looked at as a team that can only attack, but in the pre-season just gone our main focus has been defence. “We know it is going to be tough, but the boys have done all the hard work in pre-season and are full of confidence in our defence now and our structure. Roberts was impressed with the way Warrington beat Brisbane in their World Series match last Saturday. He said: “They were the better team, no doubt. “Having Kevin Brown there made a bit of a difference. He is a class player and one we will have to watch this week. Cas were in good form themselves in their one Betfred Super League game so far against Leigh and Roberts is hoping the team can maintain the same performance level at the Halliwell Jones Stadium. He added: “We knew they were going to come out in the first 20 minutes of both halves and try and throw everything they had at us. Credit to the boys, they hung in there and we got away with a good win. “We have high standards ourselves and for us it’s just a matter of turning up every week and reaching those standards, if not getting better. “The good thing about it is we know we have got a lot more to give. That’s one thing Powelly is always getting us to do, work on our games and keep improving. “I think as long as we are improving week to week we are in good stead. “Daryl and the coaching staff are continuously building on the squad and we have improved every year. “With the squad we’ve got this year I can’t see why we can’t take it one step further. There is a different buzz among us the way we finished last year and the injuries we had and the young blokes who stood up. “The young boys have taken a lot of confidence out of that and the new boys have stepped in as well. Jesse Sene-Lefao and Zak Hardaker and Rangi has done a full pre-season.